SEOUL, Nov. 23 (Yonhap) -- South Korea's Cube Entertainment on Friday launched a joint venture record label with the Universal Music Japan, seeking greater global reach for K-pop artists managed by the agency. The two companies held a formal ceremony to celebrate the launch of the new label called U-Cube at a hotel in southern Seoul. "Since we forged ties with a partner that will give a boost to the company's solid system with a history spanning 10 years and its talented artists, I think it won't take long for us to grow to be a global entertainment company," Hong Seung-sung, chairman of Cube Entertainment, said in a speech read by vice president Hong Il-hwa during the ceremony. "I hope the company will take one step after another along with Universal Music Japan in search of a new paradigm of hallyu," he said, referring to the Asianwide fever of Korean pop culture. 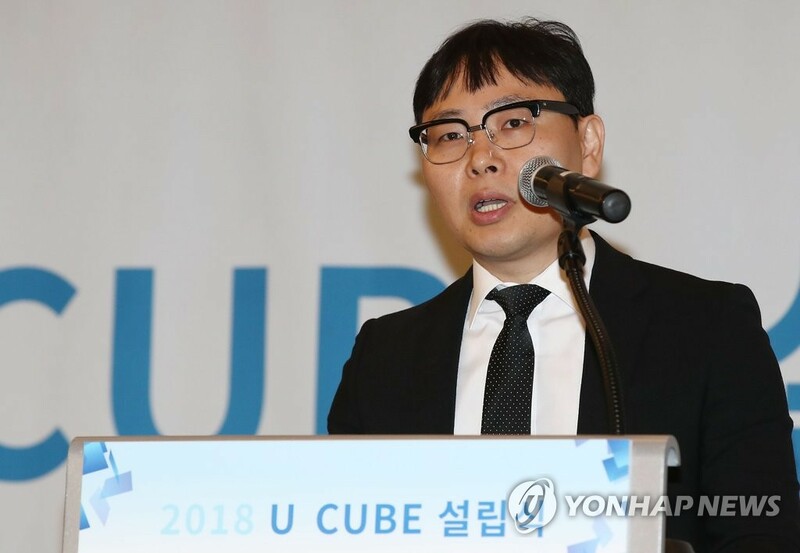 "We're going to create good artworks with Cube, which has nurtured artists full of talents," said Masahiro Kazumoto, head of Universal Music Japan. "We'll impress many people around the world with new music." He also vowed to utilize his company's networks to provide more chances for the Cube-managed artists to make inroads into overseas markets. The ceremony was also attended by Cube-managed K-pop artists, such as Pentagon, Yoo Seon-ho, (G)I-DLE, CLC and comedian Lee Hwee-jae. "We'll engage in diverse activities based on a better environment in Japan in the future," Jang Seung-yeon, leader of girl group CLC, said. Boy band Pentagon's leader Hui said: "Our members are studying Japanese language very hard. I'm really looking forward to performing on the global stage. Please wait and see."